The Butte Local Development Corporation established the Butte Elevated Awards for the purpose of recognizing and honoring outstanding Butte-Silver Bow businesses and citizens for their contributions to our community. 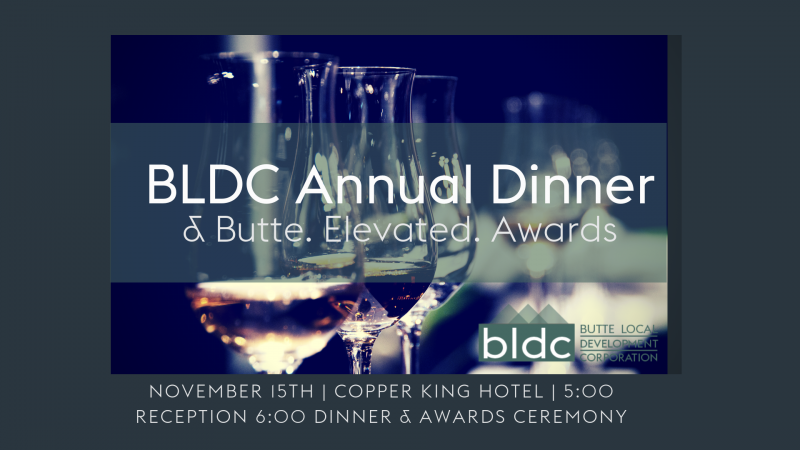 The 2018 recipients will be announced and honored at the Butte Local Development Corporation’s Annual Dinner to be held on November 15th at the Copper King Hotel & Convention Center. 5:00 pm, Friday, October 5th, 2018. Nominations are confidential and will be reviewed by the BLDC Awards committee. Selection will be based on answers to all questions. The selected company or individual will be asked to schedule a time to produce a short video, which will be presented at the Annual Dinner. Public announcement of the 2018 recipients will be made at the Annual Dinner on November 15th.